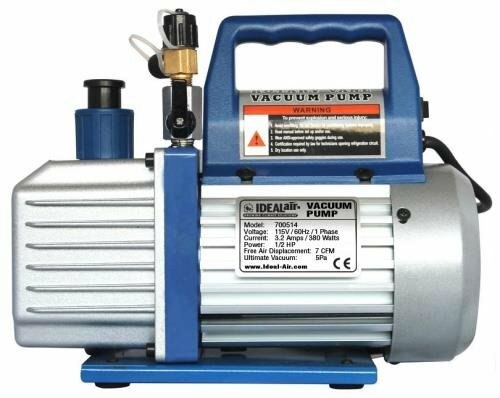 Ideal Air Ideal-Air HVAC 7 CFM Vacuum Pump 1/2 HP (2/Cs) by Ideal-Air at Tulips Orchids. MPN: 700514. Hurry! Limited time offer. Offer valid only while supplies last. High quality 7 cfm vacuum pump inpact size. Ideal for all hvac pump-down needs. Comes with pump oil, check valve and multi hose attachment port. High quality 7 cfm vacuum pump inpact size. Ideal for all hvac pump-down needs. Comes with pump oil, check valve and multi hose attachment port. Quickly pull a vacuum with 7 cubic feet per minute vacuum rate. 1/2 hp motor. 3. 2 amps/380 watts/115v/single phase.